Sons of Britches show is one of the best live music shows in Branson that combines bluegrass, country, Cajun, Rock ‘n Roll, and even Zydeco. The Sons of Britches is one-of-a-kind show in Branson that takes the local entertainment scene by storm. What began with gigs at some musical events and private functions, the performance of Sons of Britches has grown their fanbase so much that they have set up shop for their regular shows at some of Branson’s premiere live entertainment venues. These three unique entertainers will share the songs you love as they show their masterful musical performance and comedy. “The Sons of Britches” is nothing else quite like this show which is a creative mix of musical styles with a tantalizing combo platter created to cater to every music lover. With their beautifully tailored evening wear – white tux shirts with a classy black bow tie, combined with faded blue overalls – these amazing fellas really know how to put on a show. Earl “Melvin” Vaughan, John “Side Dish” Fullerton, and Louis “Squirrel Dog” Darby are accompanied by singer-songwriter, Plum Puddin’, that will make you laugh and sing along to your favorite songs of yesterday and today. These guys are great singers with terrific harmony and timing, and showmanship with superb performances on the fiddle, guitar, mandolin, and stand up bass. For a unique show that gives audiences a new and refreshing perspective on live music and awesome entertainment, the trio delivers action-packed and music-filled production that will leave you singing, clapping, and laughing along with the Sons of the Britches. There aren’t much entertainers in Branson that can captivate a crowd like this group, and once you see them perform – you’ll have no doubt that you made the right decision to see one of the hottest shows in Branson. Dressed up in their fancy attire, they are pulling out all the stops for one-of-a-kind performance in the Ozark region you won’t want to miss. As one of the most unique and intriguing shows in Branson, the Sons of Britches ensure the audience that no two shows are ever the same. Don’t let their unique appearances deceive you, as they have more than one hundred years of combined experience between them. This musical trio consists of some of the most talented singers and instrumentalists to ever perform on any Branson stage. These top-notch Branson performers will get up close and personal to audiences in the show they like to call a tribute to themselves. 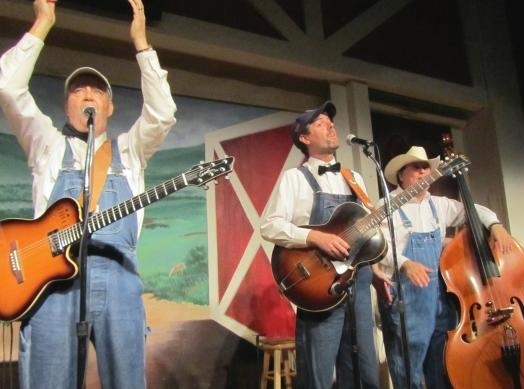 Their “Hillbilly Chic” style along with all the laughs and high-energy performances is sure to captivate audiences of all ages. Enjoy listening to all the popular tunes you know, ranging from Chopin to Boudin. Recognized for their cohesive and engaging shows, the Son of Britches pride themselves on providing their guests with down-home style of entertainment. If you will listen to the music of the Sons of Britches as they perform in Branson, you will know why they are one of favorite performers in Branson.